This critique of British journalism reveals a news media that is in a far worse state than even well-informed people may suspect. Murdoch wrested power from the unions concerned when News Corp bought The Times in the eighties. Those unions did need to lose some power, as readers may recall from Bill Bryson's account of working at The Times over that period, in 'Notes from a Small Island'. But profit has far overtaken information as the main consideration for his company - and for most of the news media. 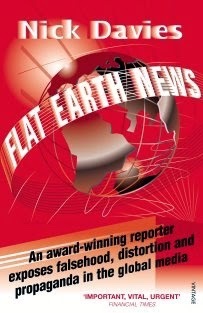 Staff cutbacks are profitable and the ranks of journalists have been decimated worldwide. Now, far fewer journalists need somehow to cover the same number of stories, leaving no time for fact-checking. The best-intentioned of journalists can seldom do the job they would like to do. Due to the resulting rush, press releases are merely regurgitated, adapted to house style. But media companies don't only want to have fewer journalists at the coal face; they want to be first as well. In the resulting rush (and one can't be both rushed and accurate in journalism) even the BBC allows its online journalists only five minutes per article. The Daily Mail systematically lies - and does so in a way calculated to stir up prejudice against minorities and disempowered sections of the community (such as asylum seekers). It also tells blatant lies about celebrities, many of whom have been awarded damages against the paper. If a complaint is upheld against The Daily Mail (fat chance, as the British press complaints authority upholds only .6% of complaints - yes, the decimal point is correct), it will publish a 'clarification' somewhere around p.68. Any such comment will never get the prominence of the original lie. It's a profitable way to operate, so that's what the paper does. Piers Morgan (that paragon of integrity ... ho ho) said: 'The public is always right.' The Daily Mail is aimed at middle-class rednecks, so lies taylor-made for that market are what it writes. The misinformed public of such newspapers is huge, with the result that such rags set a good chunk of the political agenda. Any government which places more importance on reelection than integrity (which seems to mean all governments), will cater to a constituency that uncritically soaks up 'flat earth news'. A cynical and self-serving media creates a cynical, self-serving, ignorant and prejudiced public - a public to which cynical and self-serving governments in turn feel bound to cater. With a news media like this, how can democracy not suffer? We need a better media than this. I hope it's not this bad in New Zealand, but wouldn't know, as I get all my news from Radio NZ (which hopefully is at least honest, if under-resourced). Coming soon visit Frozen 2 Full Movie Download .free Watch Frozen 2 Full Movie Online Animation,Adventure,Comedy,Family,Fantasy,Musical click here to link 【 Frozen 2 Full Movie Free Download 】 Now .